Four years ago, I became the Executive Producer of a feature documentary that’s following the quest to cure type 1 diabetes. A cure is a huge passion of mine, as one of my four sons was diagnosed with type 1 diabetes 7 years ago. The film, “The Human Trial” follows three research teams in a race to cure diabetes. The goal of the Los Angeles based filmmakers, Lisa Hepner and Guy Mossman of Vox Pop Films is to start a national conversation about the fastest growing disease in the U.S. (Hepner has had T1D for 21 years.) Most people know very little about this life threatening disease that leaves its victims insulin dependent for life. The film caught the attention of world-renowned graphic print artist Shepard Fairey (he also has T1D) who has generously donated his work to raise funds for the filming of "The Human Trial". He designed limited edition film signed posters for my readers, so act now. There are only 25 poster for sale at $500 so click here. Says Shepard Fairey: “The Human Trial deserves all the support people can give it. The documentary will bring worldwide attention to finding a cure for diabetes. I am happy to contribute to this important film.” If you’d like to own a piece of history and help support the ongoing filming, you can purchase a Shepard Fairey signed print here. A portion of the purchase is also a tax-deductible donation. To learn more about the film and watch a 5 minute sizzle reel visit thehumantrial.com. It includes footage of Islet Sheet Medical, one of the teams Lisa and Guy are following. You can also donate to the film here any amount helps and it’s tax deductible. 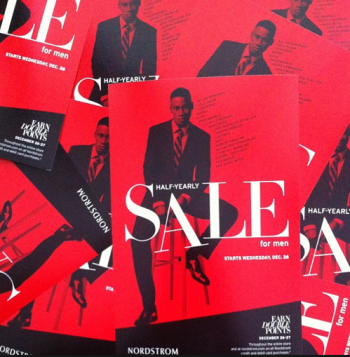 Nordstrom’s half-yearly sale for men is on now. You can save up to 40% on favorite brands like Cole Haan, James Perse, Z Zegna, Joe’s, Michael Kors, Tommy Bahama, Lacoste, John Varvatos Star USA, Faconnable, The North Face, BOSS, Joseph Abboud, Burberry and more. Sale categories include men’s clothing and shoes, accessories, designer collections, juniors and kids, plus home and gifts. Nordstrom is at South Coast Plaza, Fashion Island, MainPlace in Santa Ana, Irvine Spectrum, The Shops at Mission Viejo, and Brea Mall.